To connect to Microsoft cloud services using ExpressRoute, you’ll need to set up and manage NATs. Some connectivity providers offer setting up and managing NAT as a managed service. Check with your connectivity provider to see if they offer such a service. If not, you must adhere to the requirements described below. Review the ExpressRoute circuits and routing domains page to get an overview of the various routing domains. To meet the public IP address requirements for Azure public and Microsoft peering, we recommend that you set up NAT between your network and Microsoft. This section provides a detailed description of the NAT infrastructure you need to set up. The Microsoft peering path lets you connect to Microsoft cloud services that are not supported through the Azure public peering path. The list of services includes Office 365 services, such as Exchange Online, SharePoint Online, Skype for Business, and Dynamics 365. Microsoft expects to support bi-directional connectivity on the Microsoft peering. Traffic destined to Microsoft cloud services must be SNATed to valid public IPv4 addresses before they enter the Microsoft network. Traffic destined to your network from Microsoft cloud services must be SNATed at your Internet edge to prevent asymmetric routing. The figure below provides a high-level picture of how the NAT should be set up for Microsoft peering. You must ensure that traffic is entering the Microsoft peering path with a valid public IPv4 address. Microsoft must be able to validate the owner of the IPv4 NAT address pool against the regional routing internet registry (RIR) or an internet routing registry (IRR). A check will be performed based on the AS number being peered with and the IP addresses used for the NAT. Refer to the ExpressRoute routing requirements page for information on routing registries. IP addresses used for the Azure public peering setup and other ExpressRoute circuits must not be advertised to Microsoft through the BGP session. There is no restriction on the length of the NAT IP prefix advertised through this peering. The NAT IP pool advertised to Microsoft must not be advertised to the Internet. This will break connectivity to other Microsoft services. Certain scenarios require Microsoft to initiate connectivity to service endpoints hosted within your network. A typical example of the scenario would be connectivity to ADFS servers hosted in your network from Office 365. In such cases, you must leak appropriate prefixes from your network into the Microsoft peering. You must SNAT Microsoft traffic at the Internet edge for service endpoints within your network to prevent asymmetric routing. Requests and replies with a destination IP that match a route received via ExpressRoute will always be sent via ExpressRoute. 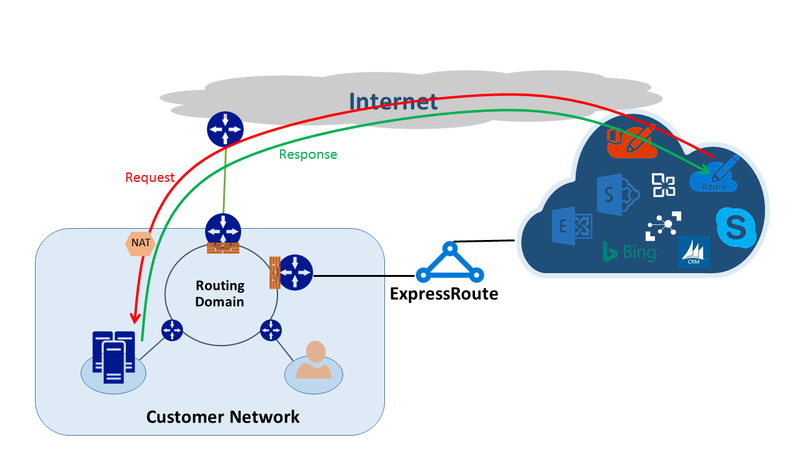 Asymmetric routing exists if the request is received via the Internet with the reply sent via ExpressRoute. SNATing the incoming Microsoft traffic at the Internet edge forces reply traffic back to the Internet edge, resolving the problem. Azure public peering is not available for new circuits. The Azure public peering path enables you to connect to all services hosted in Azure over their public IP addresses. These include services listed in the ExpessRoute FAQ and any services hosted by ISVs on Microsoft Azure. Connectivity to Microsoft Azure services on public peering is always initiated from your network into the Microsoft network. Therefore, sessions cannot be initiated from Microsoft Azure services to your network over ExpressRoute. If attempted, packets sent to these advertised IPs will use the internet instead of ExpressRoute. Traffic destined to Microsoft Azure on public peering must be SNATed to valid public IPv4 addresses before they enter the Microsoft network. The figure below provides a high-level picture of how the NAT could be set up to meet the above requirement. You must ensure that traffic is entering the Azure public peering path with valid public IPv4 address. Microsoft must be able to validate the ownership of the IPv4 NAT address pool against a regional routing Internet registry (RIR) or an Internet routing registry (IRR). A check will be performed based on the AS number being peered with and the IP addresses used for the NAT. Refer to the ExpressRoute routing requirements page for information on routing registries. There are no restrictions on the length of the NAT IP prefix advertised through this peering. You must monitor the NAT pool and ensure that you are not starved of NAT sessions. Refer to the requirements for Routing and QoS. For workflow information, see ExpressRoute circuit provisioning workflows and circuit states.